It’s been a while since the folks at Game House released a new mobile Xbox Live game, but that will be changing very soon. 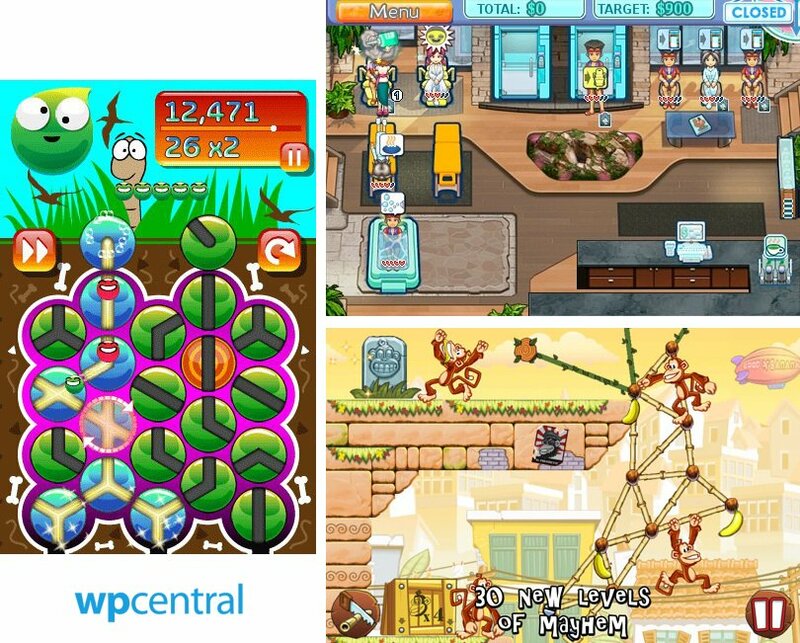 WPCentral is pleased to announce that Game House will be publishing three more Windows Phone Xbox Live games in the months to come. All three are sequels and should be a lot of fun when they finally roll out. Head past the break for full descriptions and more Game House news. Droplitz Delight: The original Droplitz is known in XBLA and Steam circles as a tough and somewhat sterile puzzle game. The mobile-exclusive follow-up rectifies both of those complaints, and more importantly, it’s just plain delightful. In each level, players are tasked with guiding the adorable droplitz from the top of the screen to the bottom. You’ll have to quickly rotate a bunch of tiles in order to create a safe path for the little liquids, and then do it all again after the old path disappears. Gameplay modes like Target Quest, Dash, Classic, and Free Play should accommodate a variety of play styles. Sally’s Spa: After taking the beauty salon industry by storm in Sally’s Salon: Luxury Edition (review), plucky entrepreneur Sally has set her eyes on building a successful chain of day spas. Sally’s Spa is a time-management game with 50 levels for players to master. Sally has to juggle the needs of countless customers, hopping back and forth between stations to help everyone relax and feel beautiful. This sequel improves on the first game’s upgrade system, while also adding new and distinct minigames for each kind of treatment, such as applying hot stones to people’s backs and painting their toenails. Those tasks might sound silly to our more masculine readers, but even brawny dudes may find that time management games are easy to get into and work great on the go. Tiki Towers 2: Monkey Republic: Over a year after its release, Tiki Towers (review) remains the most polished and enjoyable physics puzzle game on Windows Phone, so we’re definitely excited for the sequel. Monkey Republic includes 30 more levels of tower-building fun as players work to get their team of monkeys safely across each level. Enhancements include levels with multiple exits, new tools like magnets and bolts, and now monkeys can now move through water as well – but they can also drown. While none of these titles has a concrete release date or price yet, Droplitz Delight should land within the next couple of months. Sally’s Spa and Tiki Towers 2 will follow soon thereafter. All three will be Xbox Live releases and feature 200GamerScore worth of Achievements. In other GameHouse news, the publisher continues to produce non-Xbox Live games under their RealNetworks label. Time-management sims Delicious! and Cake Mania Main Street are two such titles. Both were originally announced as Xbox Live titles before switching to indie status. If you can’t wait for Sally’s Spa to come along, these two could certainly hold you over. You’ll find Delicious! here and Cake Mania Main Street here on the Marketplace. Both games cost $2.99 and have free trials.